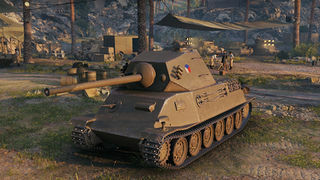 The Škoda T 25 is a Czechoslovakian tier 6 medium tank. Un desarrollo posterior del carro medio T-24, este vehículo fue desarrollado para el Ejército Alemán en 1942. El proyecto se consideró obsoleto. No se fabricaron prototipos. The Škoda T 25 leads to the Konštrukta T-34/100. Good top speed and acceleration. Fast magazine cycle time and reload. Poor alpha damage for both guns. Thin armour combined with large size. Weak ammo rack, similar to the Škoda T-24. Tied with Chi-To and VK 30.02(M) for 2nd worst hull traverse among all Tier VI medium tanks. 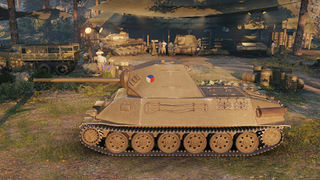 This vehicle performs very similar to the tier 7 Japanese Chi-Ri. Use your acceleration to peek behind cover and unload as many of your shells into the enemy as you can. Take care not to get hit, as you have neither the armour nor the HP to do so. If you cannot unload all three of your shells without taking a hit, retreat. Your magazine reload time is very short compared to other autoloading tanks at this tier at approximately 8 seconds. Overall, it performs best as a hybrid between the Chi-Ri and the previous Škoda T-24. 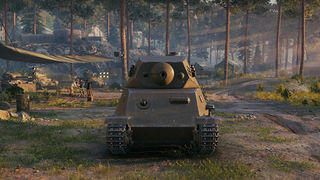 Lastly, start grinding for the Konštrukta T-34/100! Esta página fue modificada por última vez el 25 oct 2016, a las 09:08.